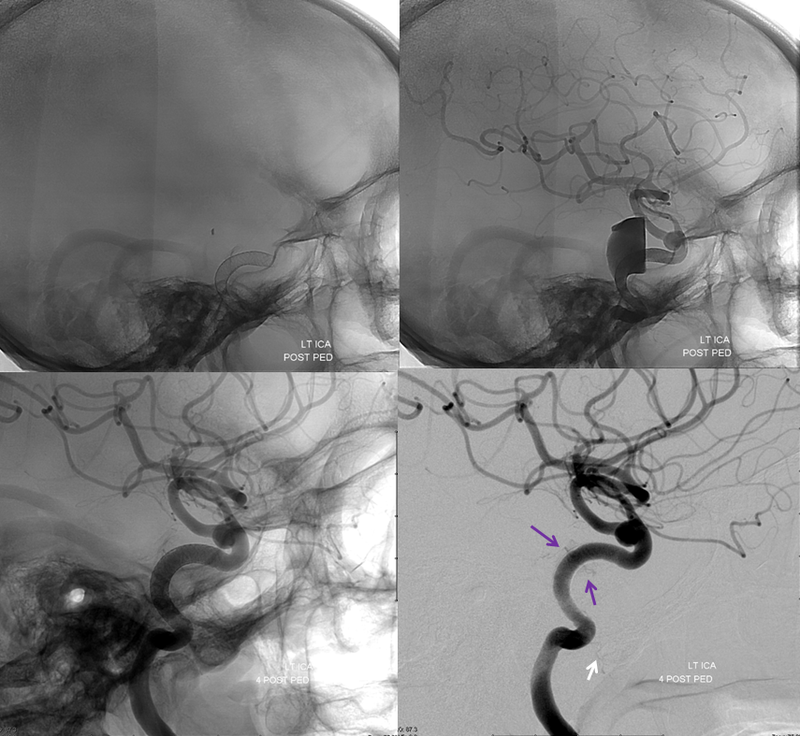 1) Dorsal ophthalmic artery — originating from the adult location of the ILT and entering the orbit via the superior orbital fissure. The role of this artery gradually diminishes. 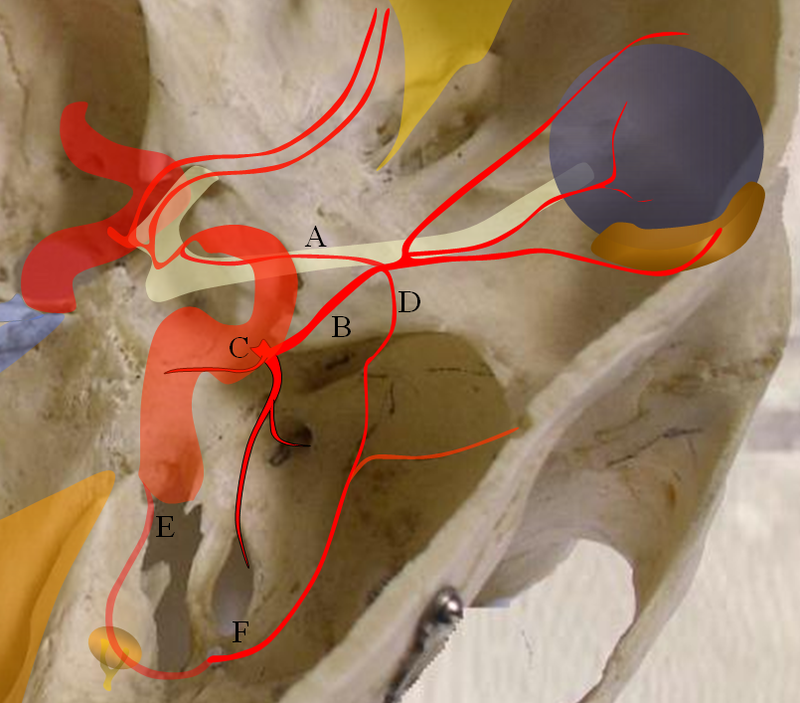 In the adult, the anteromedial branch of the ILT and the recurrent tentorial branch of the ophthalmic artery (see figure below) correspond to vestiges of the embryonic dorsal ophthalmic. 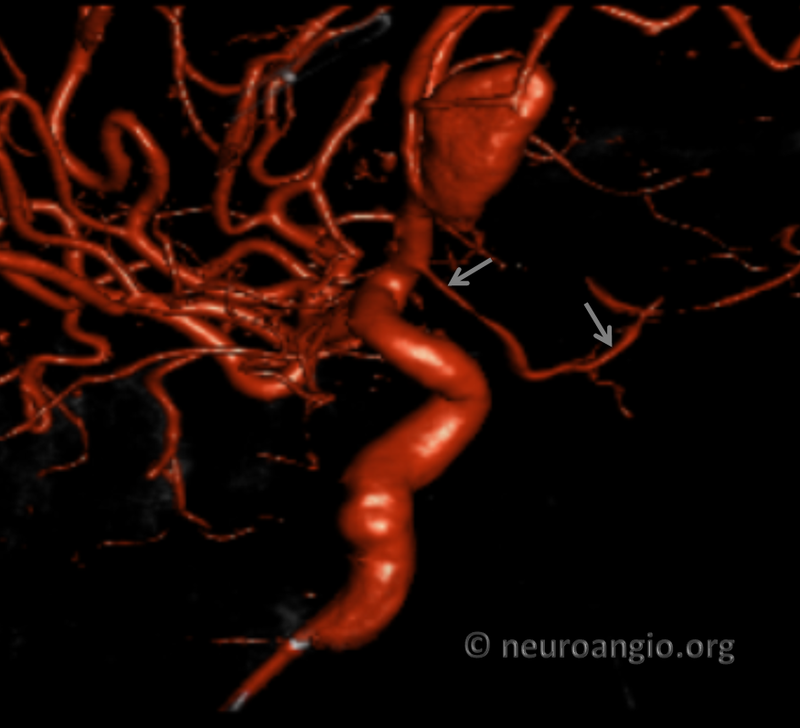 Very rarely, this artery persists into adult life to maintain dominant supply of the orbit, as illustrated in a case below. 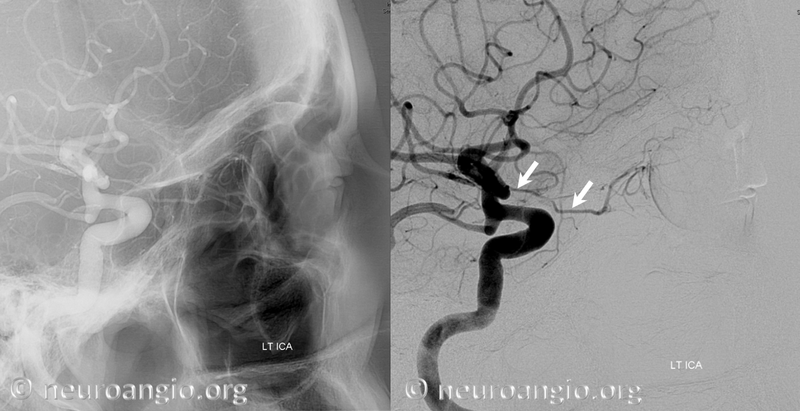 2) Ventral ophthalmic artery — this seemingly strange vessel orginates from the supracliniod carotid artery or the anterior cerebral artery (what would later become the A1 segment) and enters the orbit via the optic canal to anastomose with the dorsal ophthalmic artery. Some mammals, such as horse, maintain this disposition as the dominant solution to orbital supply. 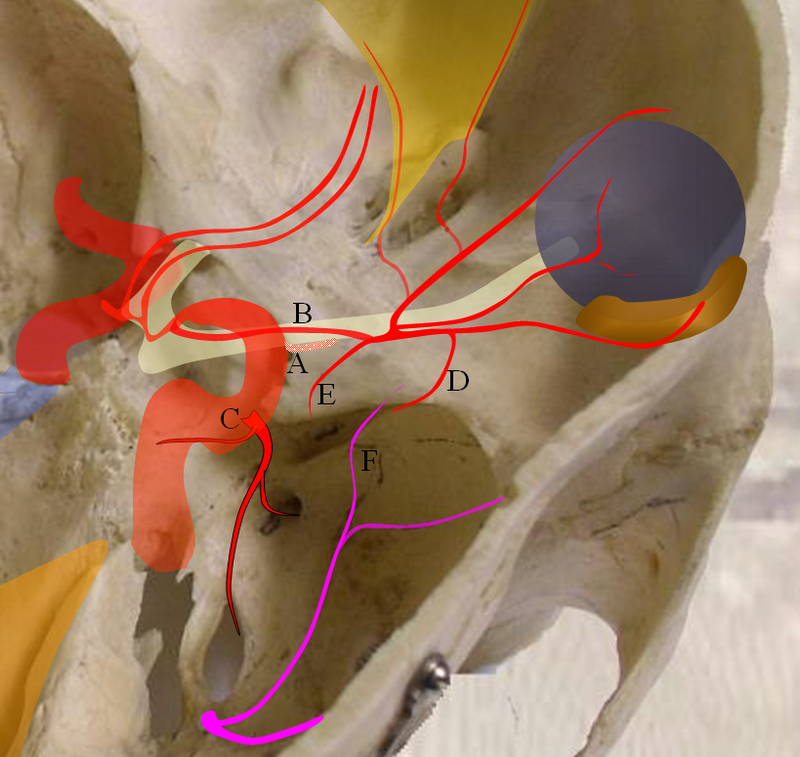 On occasion, this arrangement can persist in the human also (more common than persistence of dorsal ophthalmic). 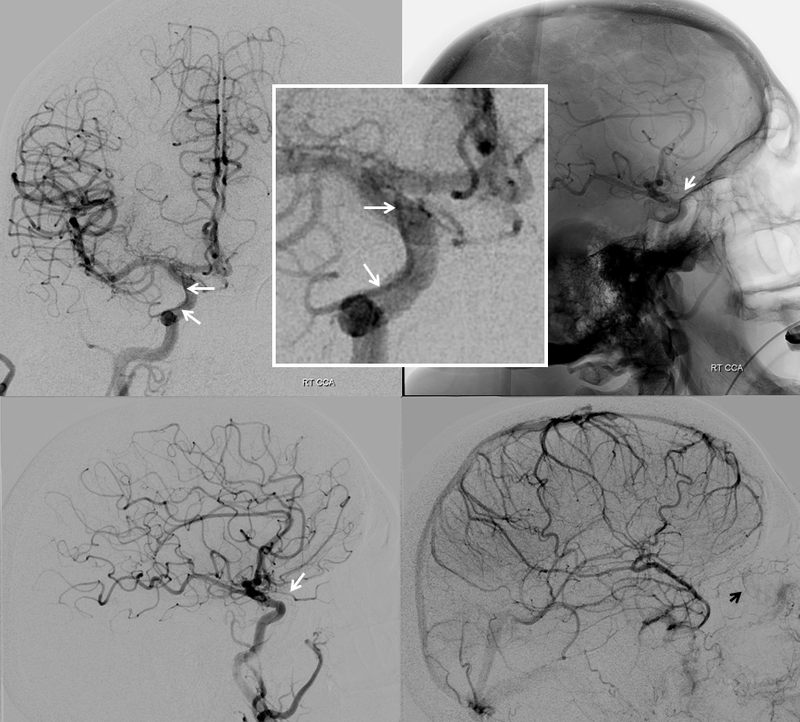 Literature reports of an unusual ophthalmic artery origin with the vessel coursing above the optic nerve in fact are describing this disposition (see example below). All of the above arrangements can be either complete or partial. 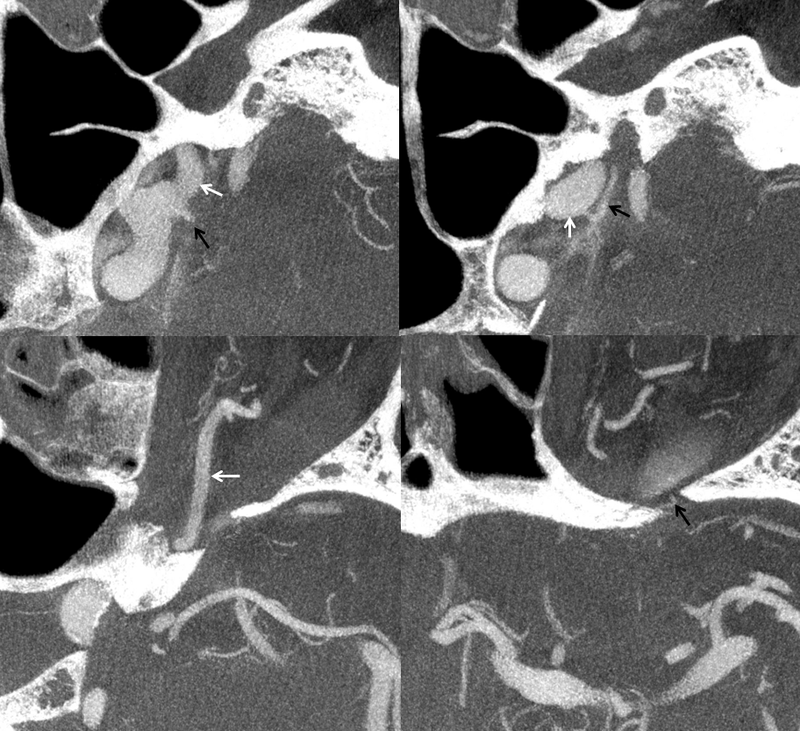 For example, a “usual” origin ophthalmic artery may supply the globe (and central retinal artery) while the MMA vascularises the lacrimal gland (in which case it is called the meningo-lacrimal variant). So, variability is the rule. 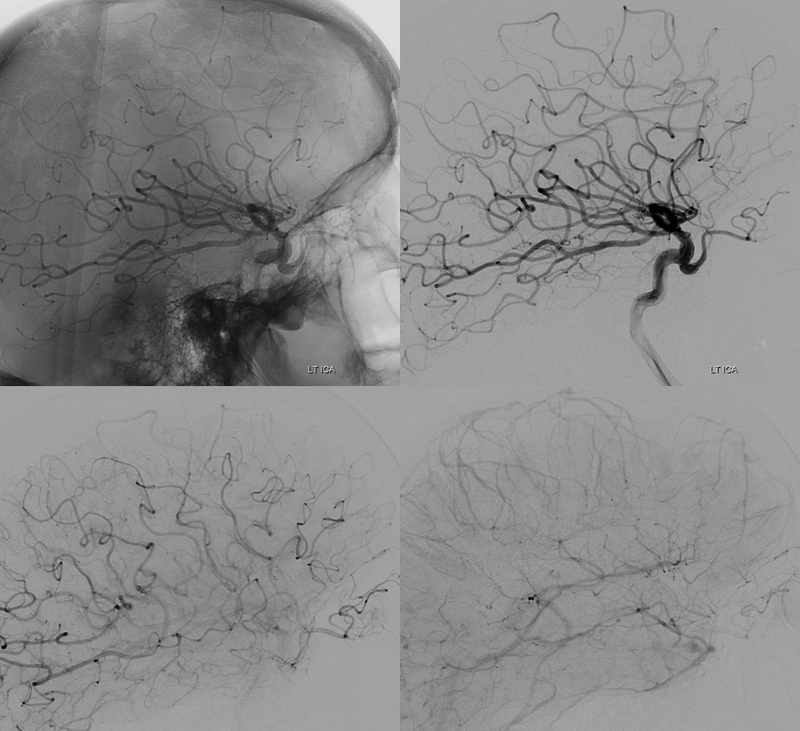 From a clinical perspective, the most important vessel is the one producing the choroid blush, although any variable supply to the orbit should give one great pause prior to any kind of embolization. 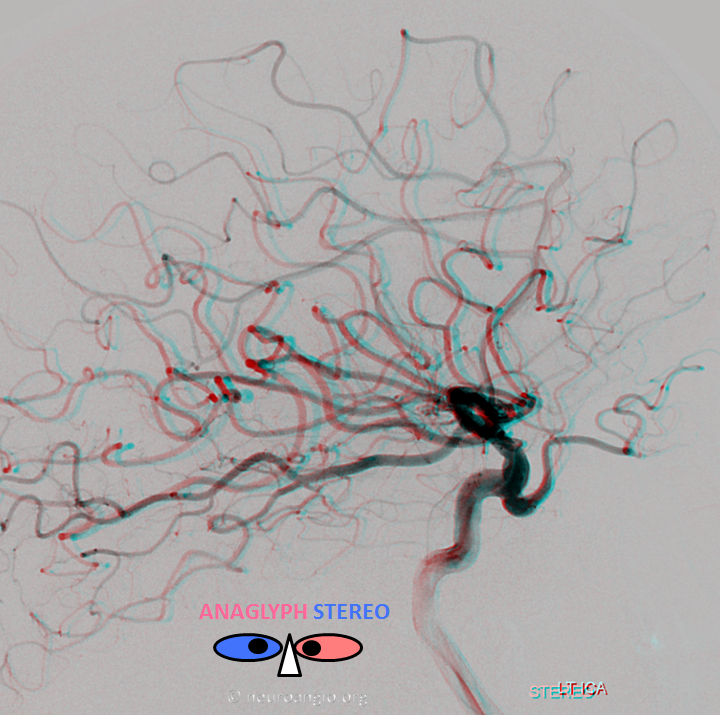 Intraorbital anastomoses between separate systems will exist and embolization of the central retinal artery will be a major disaster. 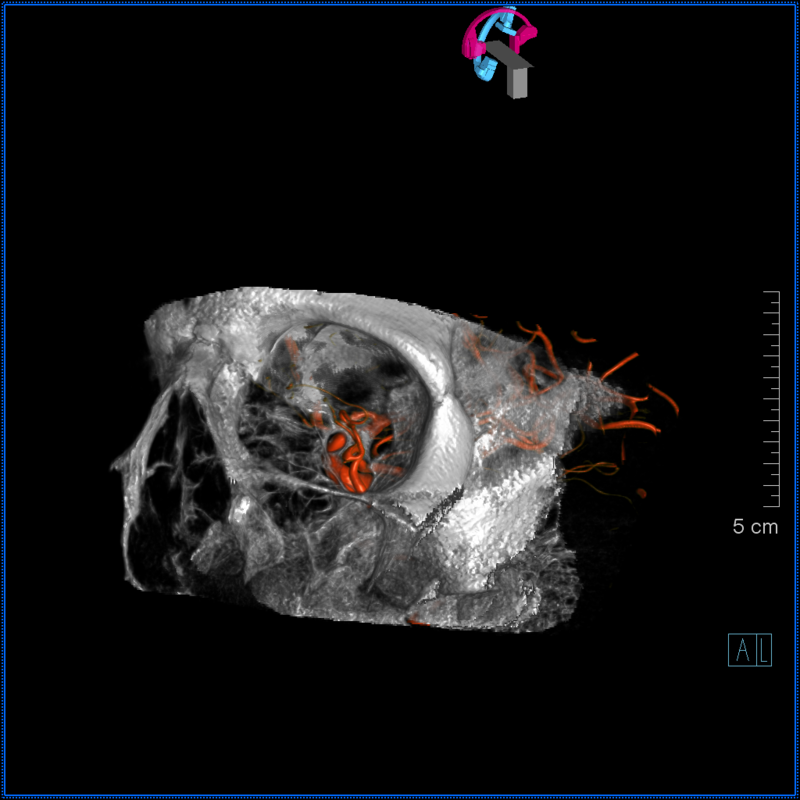 Getting back to embryology, it is not clear to me how the above-describes triumvirate looses out to a vessel that seemingly comes from nowhere. 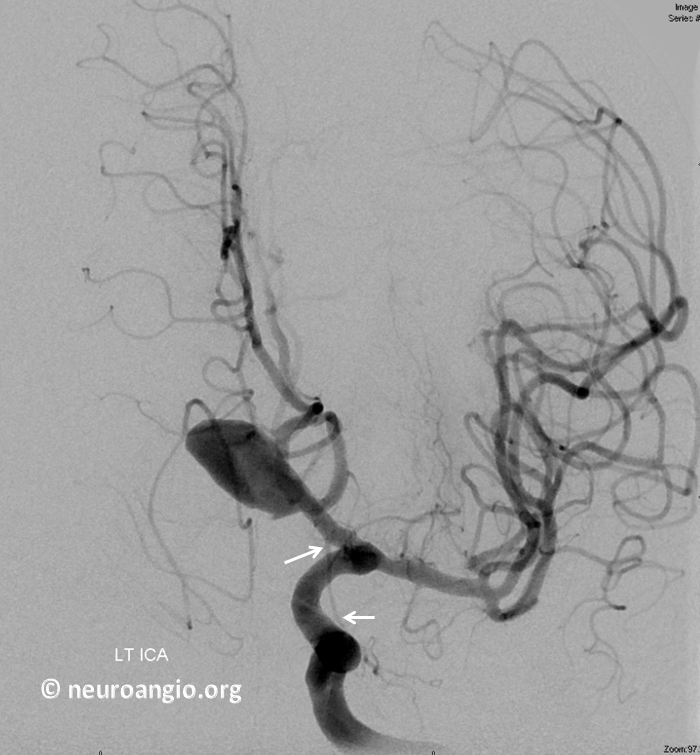 Some very respectable authorities (Pierce Morris, for example) believe that the adult ophthalmic artery evloves via gradual transfer of the origin of the ventral ophthalmic artery caudally along the ICA until it reaches its usual point origin at what is eventually called the ophthalmic segment. The mechanism of this is unclear and I do not think that all authorities on the subject share this view. 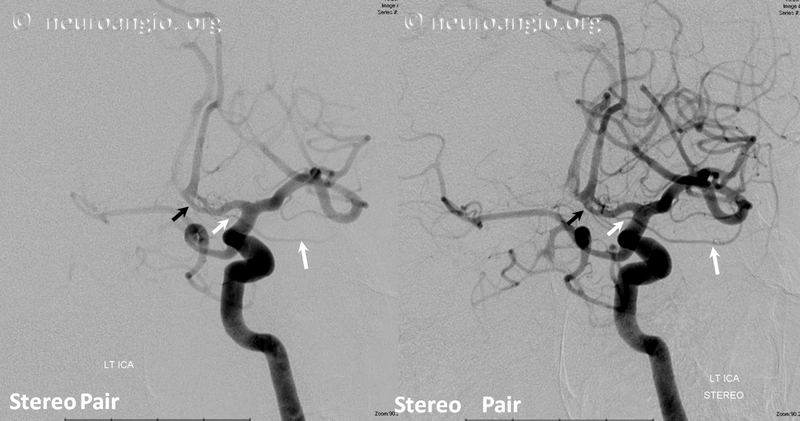 Lateral projection views immediately post Pipeline embolization (top), and 4 months later (bottom). 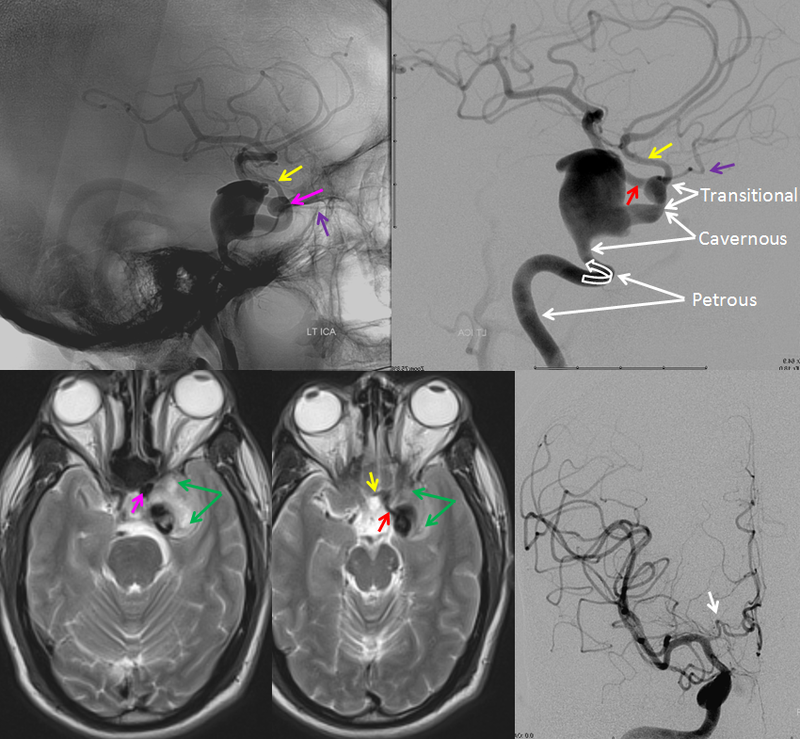 Notice branches of the MHT (purple arrows) which remain open, and are now visible after the aneurysm has disappeared. 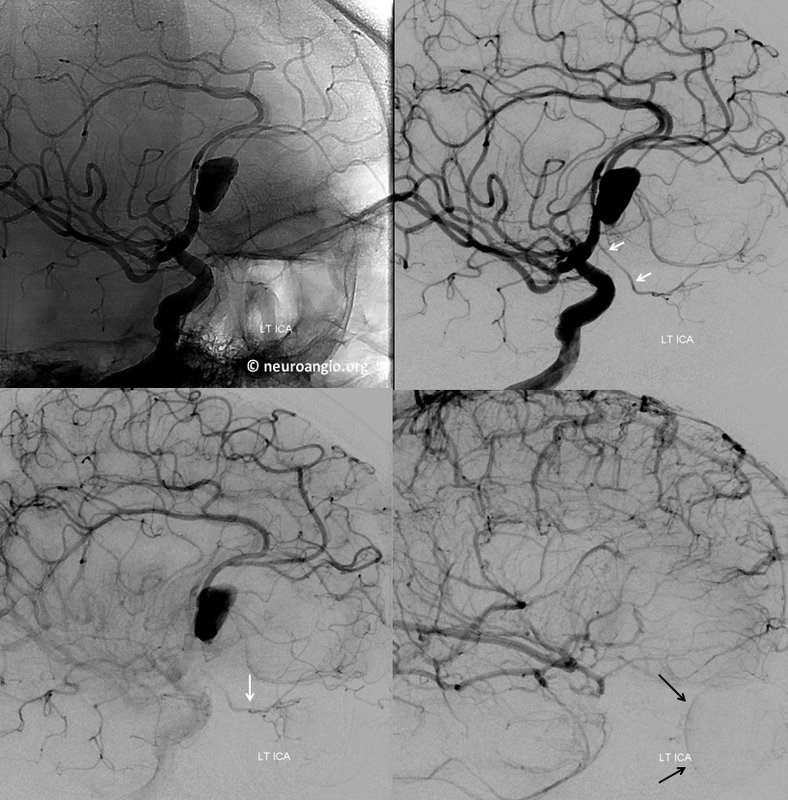 The mandibulovidian artery is again marked with white arrow. 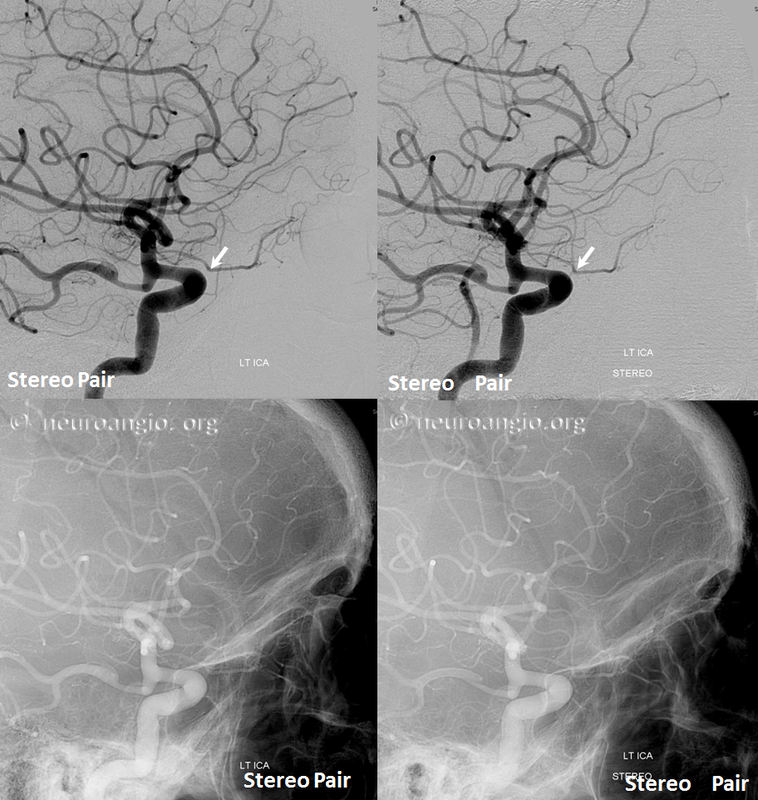 Left side shows a very large dorsal ophthalmic artery — embryologically this is the same as the anteromedial branch of the ILT.